Steven (Chicagoland, United States) on 24 January 2019 in Architecture and Portfolio. Another return to the series that I call "What's old is new again." (Tag: woina). The original photo that was posted was overly processed in HDR (What was I thinking?). So here is a "re-do" that I hope is more tastefully done. Founded July 24, 1859, the First Presbyterian Church will be celebrating its 160th Anniversary. 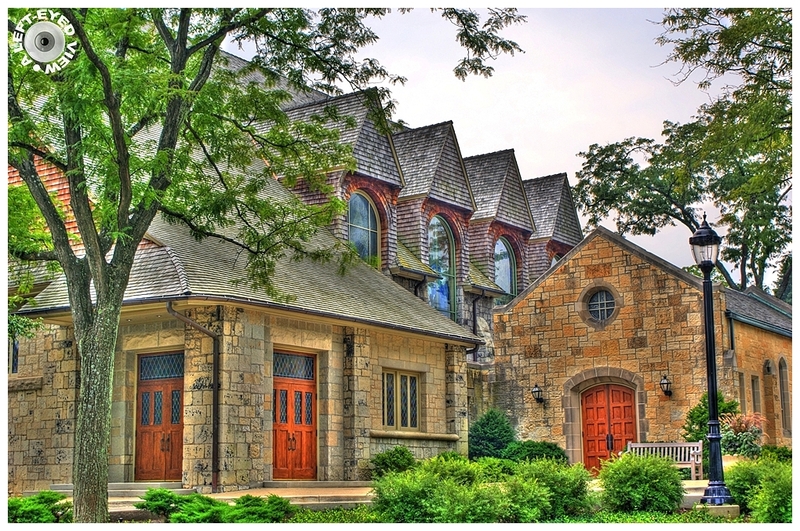 Located at 700 N. Sheridan Road in Lake Forest, Illinois. Photo taken September 6, 2009.
wow...looks beautiful !!!! !What an impressive structure ! It is a church that does not look like a church but rather a collection of houses. Interesting. Stunning image. Architecture is beaitiful. Wonderful hdr- effect. Perfectly done for this image. Espléndida vista de la arquitectura, con buen color y luz. ***** Buena jornada. I prefer the first one ! On dirait un tableau... Les couleurs sont très belles ! Handsome and well preserved on a fine piece of property by the looks of it. I don't recall the older image and always think of your HDR use as subtle. This is no exception. Looks great. An excellent processing update to this beautiful image. It's a gorgeous building. Yes, this one is much more appealing. Though when HDR was first being used, I did appreciate those sharp and gritty details. SOmetimes it still works well. Je préfère cette version aux tons plus doux. Beautiful ! When you look at the first version and you know that it was a hdr processing ...well...it is ...but not bad also ! Ah oui, nettement plus belle que l'autre version. Magnifique changement. Beautiful building. I like the HDR update. I usually prefer HDR that does not "scream HDR" but is more subtle like this one. But the bottom line is that is YOUR art, so if you are willing to accept the criticism, you have the final say. (But I agree with you that the new version is better). Just fantastic, Steven.....With respect to the topic noted by Harry, I reject the notion that accuses HDR as being not-artistic....It is a long argument....Nevertheless, I am one who. indeed, used to feel that way - but now I have no issues with HDR because work by fantastic artisis like you, over the years, have definitely changed my mind. Forge Ahead, sir!!! Your work s artistic, beautiful, and definitely has a place in this artistic world!!! It's a beautiful church, Steven, and is so inviting with so many beautiful doors! I think this version is better than the previous one. But even so, I'm not an HDR fan. I think the photos turn out to be too artificial. The new version of this church is there is successful. A great looking church. quel prsbythère et église quelel vue et cpatage fantastique iamge et rendu archtiectural. Even before I read the title I thought this is a presbyterian church. What an elegant building with the different shades of bricks in its facade.